Laos and China have vowed to increase cooperation to promote tourism between the two countries with the aim of attracting more visitors. That was the message at the Laos-China Tourism Forum in Vientiane yesterday where participants shared their experiences in the promotion of bilateral tourism. Minister of Information, Culture and Tourism Prof. Dr Bosengkham Vongdara told the forum that tourism is one of the fastest-growing sectors in the world while noting that Laos had stepped up cooperation with many countries, especially China, in bolstering Lao tourism. “This forum is important because it will multiply tourism cooperation between our two countries and promote tourism as part of the Belt and Road Initiative,” he said. “In addition, Laos is teaming up with China to organise Lao-Chinese tourism year 2019, which will have multiple benefits for both countries,” he added. 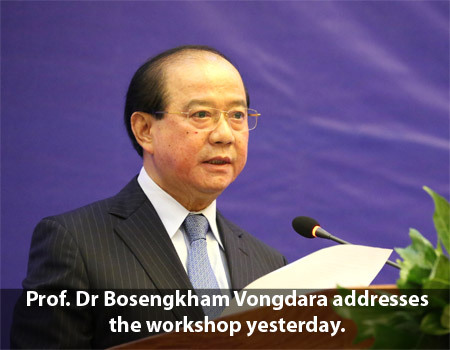 Prof. Dr Bosengkham detailed long-term Laos-China cooperation in the tourism sector. More than 639,180 Chinese nationals visited Laos last year, an increase of 17 percent compared to 2016, and visitor numbers are expected to rise in the future. Laos has attended international tourism exhibitions in China and worked closely with China to increase the number of direct flights as well as developing important infrastructure such as the Laos-China railway which will be significant in promoting tourism between the two countries. Chinese Deputy Minister of Culture and Tourism, Mr Du Jiang, told forum participants that Laos and China should extend their tourism cooperation and continue to share ideas. Meanwhile, China’s Ambassador to Laos Mr Wang Wentian said the meeting was a good opportunity for Laos and China to exchange information about tourism and the service sector as well as jointly develop tourism products. He hoped the two countries would intensify tourism marketing efforts and said Lao authorities should explain to visitors the regulations regarding local culture and traditions. Lao tour guides also needed more training to meet visitors’ needs, he said, adding that Chinese tourists like to visit historical, cultural and natural sites which Laos has in abundance. In the first three months of this year, 221,800 Chinese visited Laos, an increase of 32 percent on last year, while the number of Lao visitors to China also increased, he noted.